PRAS, Ep. 4: Well, if they aren't leaving, maybe I should. 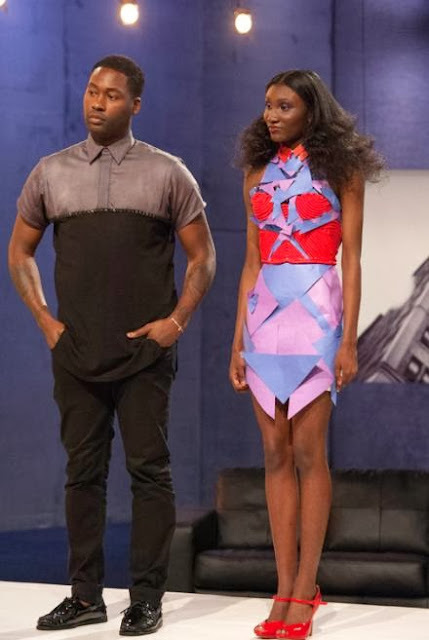 Project Runway All Stars, 1: THAT is Punk?! I wish THIS wasn't my attempt at a comeback. We did the right thing while dressing for less. Episode 4 starts out with the eight designers waiting outside of Parsons, when a school bus pulls up. The viewer knows it's a school bus because, in case you have never seen such a strange 25,000 pound giant, yellow vehicle, it had "SCHOOL BUS" written in large letters on it. For some reason getting to ride on a school bus is very exciting to the designers. This is either because they are so old that there were not school buses back when they had to walk to school barefoot, uphill both ways, or they were spoiled, rich kids who had chauffeurs take them to school. I don't know their lives, but I do know that if they had ever ridden on a school bus before they wouldn't be excited to be on one again. 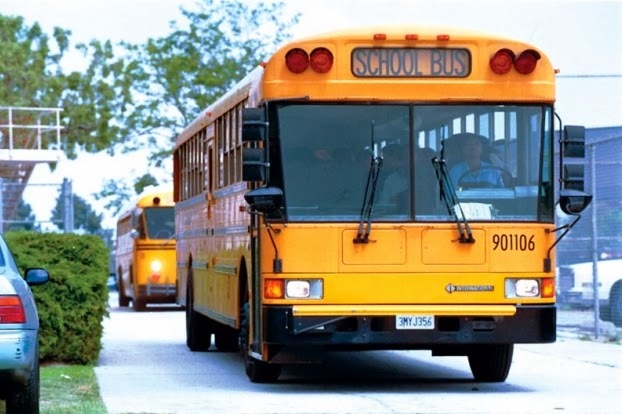 Especially if they had Debbie the School Bus Driver, like I did, who made us have assigned seats and said "Goodbye, Chaleannn." every. stinkin'. day. Again, despite the fact that riding on a school bus is very little fun for anyone with memories, all the designers are giddy. Especially Bad Neck Tattoo Guy. The dummy said this about it: "[This is] one of the most fun things I've gotten to do in a long time!" I feel sad for him. I take back the thing I said about Jeffrey's bad tattoos because he's obviously has enough problems. Standing dangerously close to the designers, Lamelyssa Milano explained that they are at the legendary "PS 212 classic school" or something that only New Yorkers would probably know about. The designers have four minutes to run in and grab items in a classroom for the Infamous Unconventional Challenge. Viktor put out his sassy hands and said "Wha?!" before they ran in and started snatching every primary colored piece of plastic in the Kindergarten class. After they grab their junk, they sit on tiny people chairs and cut and paste like real adults. They all get to the studio and start to work. Elena gives Viktor, her best friend on PRAS, an idea about cutting up rulers and then he uses that idea while telling everyone he came up with it. This understandably upset Elena. And if I didn't dislike her so much I might actually care. I assumed she was going to throw Viktor under the school bus (har har har) at the runway show but she goes all omertà on us and only silently seethes. Zana Roberts NotGunn comes in looking more fresh than usual. Zana said to Elena, "You look angry." Elena replied "I'm not angry." and immediately started crying ugly tears. Zana reminds the Annoying Drama Queen that she "can do it" and has "been in the top" for most of this pathetic season. Viktor, Elena's PRASBFF, said "This isn't like novelas. Stop crying." Me encanta Viktor. They all keep working, models get make-up on, they get dressed, snore, snore, snore. At the runway, Dullyssa Milano comes out and puts a hand on her stupid hip. 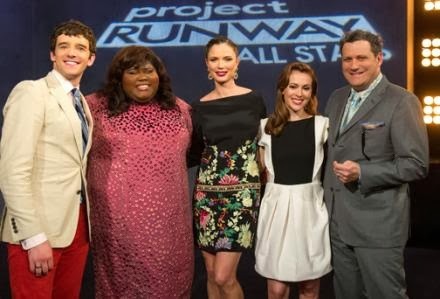 She talks about Mary Kay, "the gorgeous Georgina Chapman", pre-recorded clip about how awesome Marchesa is, Isaac, and the fabulous guest judges Academy Award Winner Gabourey "Precious" Sidibe and Michael "Ugly Betty" Urie. Let's start the runway show! Irina's model walks out in a very girly, flowery dress made from something that did not start out pretty. She is merely safe and usually forgettable. Seth Aaron's model has fake sticky note eyebrows, a hideous kick ball shower cap, a paper doll's shirt, a bicycle streamer skirt, and some QVC Accessory Wall shoes. He is somehow safe. Viktor's dress is in the top three and rightly so. Even though he stole the idea from Elena and pawned it off like he's a genius who just "discovered" he could cut up rulers to make them awesome, his dress was pretty cool. As usual, he looks ridiculous and I love it. Elena's model walks out and, unfortunately for me, looks pretty good. 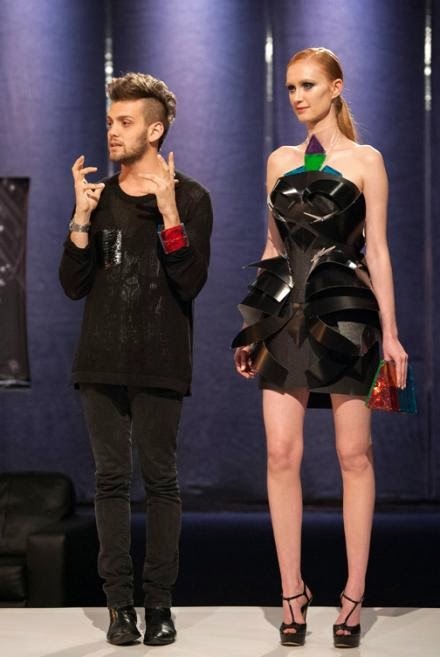 The judges are super impressed by what she did in the dress's "pointy little boobies" (fashion words!) and there are no tears shed by Elena. She and her giant donut hair are in the top. Chris' model walks out in his public service announcement piece about bullying. Chris, someone who was bullied a lot for being gay, believes he should win. "My statement is too important and my structure too awesome." In the end he was right... drum roll.... and he won the challenge. Woot. His black exoskeleton won despite the fact that Isaac felt "manipulated" by Chris' speech about being bullied. "Really who hasn't been bullied..." said the homosexual Isaac. Korto's dress walks out and is kinda neat and Native Americany on top, but it has stupid binder clips holding it together. Isaac said "The clips are punk but punk like three weeks late." Whatever that means, I'm sure it was hurtful. Korto is in the bottom three! Jeffrey is, of course and again, in the bottom three. Mychael's model is wearing a dress is inspired by a 4-year-old's homemade birthday card. 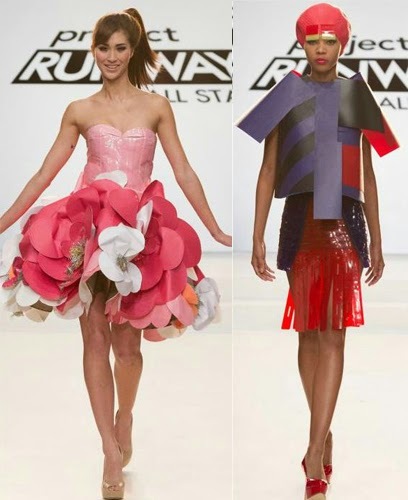 Construction paper was littering the runway. The judges aren't impressed but Isaac loved the color scheme because he must be colorblind. Mychael is the also in the bottom three. Korto, Jeffrey, and Mychael were criticized in worthless fashiony words. However, probably due to the pills Jeffrey slipped them to alter their minds, the judges determined that ALL THREE OF THEM should stay. Alyssa said, "We couldn't see a reason to eliminate one of you so we kept all of you. We're getting down to the best of the best. Go on out of here, you're safe." To me, they are all worthy of a big, fat "auf wiedersehen!" 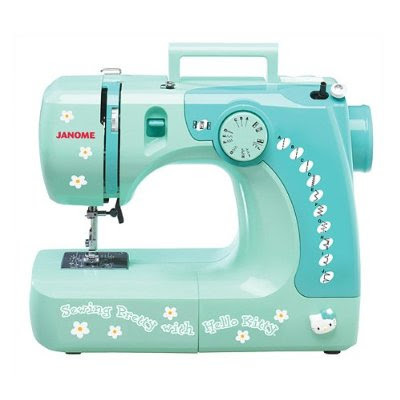 Yes, this is coming from a woman who started her first sewing project (a pair of Butterick Easy Sew pajama pants) a year ago only to find out that her Sewing Pretty with Hello Kitty sewing machine was of faulty design. And, yes, I have had that Hello Kitty sewing machine for long enough that the generous warranty ran out so I can no longer return the sewing machine that was factory flawed.... but still. Despite my lack of credibillity - I mean, I'm no Alyssa Milano: Fashion Queen - but I have eyeballs and they can clearly see that all three of these are crap. I don't think Heidi Klum and Nina Garcia would have let these three go on to the next round. But, hey, the PRAS gods probably just want to fill up the episode quota and don't care if it's all fluffy crap. Well, I guess I'd better get to watching episode 5 before episode 6 airs tomorrow night (nope... won't happen). It's a Bonnie and Clyde challenge, probably just in time to plug the new made-for-TV Bonnie and Clyde movie. Big sigh, quick nostril flare.